Five years ago Harrogate Borough Council began to look at how, in years to come, we could continue to work efficiently and at the same time still deliver quality services that have high levels of customer satisfaction. We knew that to achieve this we needed to look at the way we currently worked, and the offices we currently worked from. Having staff spread across five sites in Harrogate, in buildings that for the most part weren’t suitable for 21st Century ways of working, with five different reception points, five sets of business rates and five sets of utility bills was both impractical and uneconomical. In July 2015 following extensive research, consultation and discussion with residents, businesses and other organisations in the district, the council decided to build a new civic headquarters on its Knapping Mount site in Harrogate. 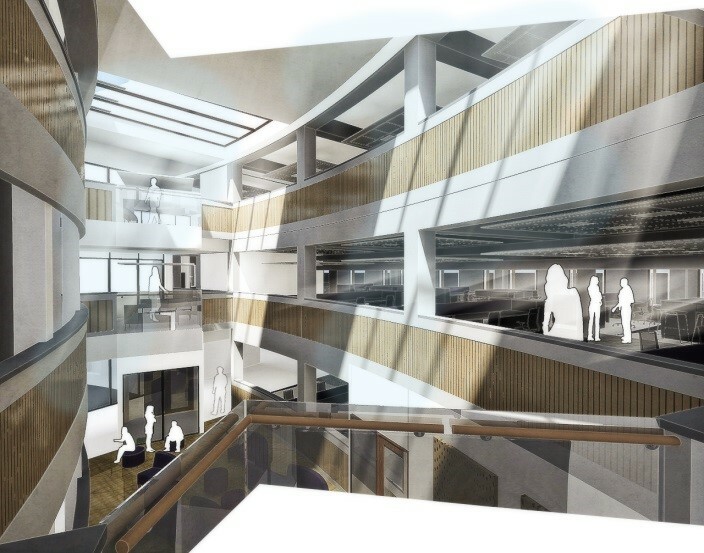 The new headquarters will include energy efficient office space and a purpose built customer service centre. It will allow the council to offer better customer services and maximise staff efficiency, as well as saving around £1 million on current running costs. An exciting new era for Harrogate Borough Council has begun, with the official opening of its new civic centre. Council Leader Councillor Richard Cooper unveiled a plaque at a ceremony to officially open the new energy efficient offices, designed by Yorkshire based architects Farrell and Clark. The new building sees council services operating from a single site rather than five separate locations. The civic centre enables the council to offer better customer service and maximise staff efficiency by reducing duplication, sharing resources and streamlining processes – all of which will result in efficiency savings for the council of around £1 million a year. Work on the construction of the new offices began in October 2015, with Yorkshire based Harry Fairclough Construction the main contractors. Staff from the council’s old offices at Crescent Gardens, Springfield House, Scottsdale House, and Kennion Road and Ripon housing offices have now all moved into the building, which opened to the public earlier this month. Councillor Richard Cooper unveiled a plaque in the entrance of the new civic centre on St Luke’s Mount in Harrogate. He was joined at the official opening ceremony by councillors and officers who have been involved in delivering the flagship scheme. Councillor Cooper said: “Our new purpose built offices will streamline how we operate, with most council services now based in the one building, and will further improve on the high standards of customer service we provide for our customers. “It will save money, too. For decades the council has been operating from five buildings Harrogate town centre; that’s five sets of business rates, utility bills and operational costs, all of which meant we were operating at a much higher cost than we needed to. “Moving to these new offices will see annual efficiency savings of around £1 million and put us in a good position to achieve further savings too. For further information email news@harrogate.gov.uk or call the media office on 01423 556825.